The team’s troll is based on a river troll. With some tinkering I could see that a classic “lineout” Blood Bowl pose would be possible. I glued the legs to the torso in a way that meant the troll was leaning forwards more than usual (this was achieved by liberally soaking the entire area of the join with plenty of liquid polycement, which melts the plastic allowing the joint angle to become ever so slightly flexible while setting). After drying I sanded down the feet to facilitate this pose, then, one of the clenched fists could be positioned so that it rests on the ground, with the joint being filled in with putty. The left arm was posed with the troll about to crump an unfortunate opposing player. Again, a little rough putty work at the shoulder and joining to the pectoral muscle was needed, but I kept it quick as I knew I’d likely be covering up the shoulders anyway. During posing I made sure the pose would look right with the alternate hand shown below (a Carnifex claw). The last adjustment to make the pose work was to turn the head to the right so he’s glaring right at the other team. Just a little cutting and filing of the neck and then because this pose reveals a lot of neck that you wouldn’t normally see, sculpting in some bulbous flesh to blend everything together. The next stage was to add the warpstone outcrops growing on the trolls back. This was definitely a rare case of “more is more”. 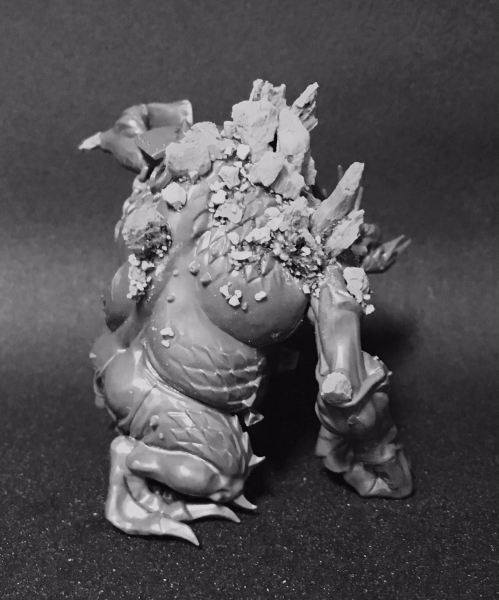 I’m using small cork rocks (generally used for scenic modelling) for the bigger shards of warpstone, and started by adding a few dotted around the model. These looked really out of place – so I tore them off and tried a couple of different locations and rock shapes but nothing seemed to work. 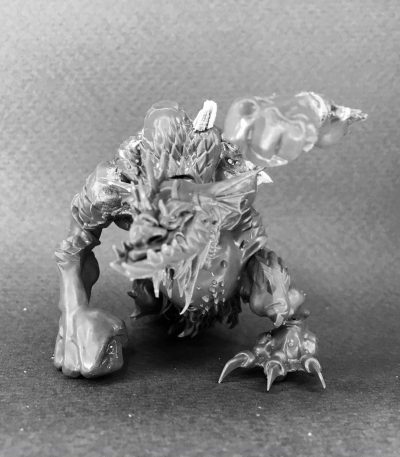 So much so that I shelved the troll for a few weeks and lost any kind of inspiration to continue with the model. The initial concept was really to have a huge outcrop of rock on his back – these small rocks weren’t cutting it. The breakthrough moment was esssentially thinking “sod it – what’s the worst that can happen if I just keep adding rocks?”. This was one of those times I just needed to persevere past the point of the miniature looking a bit naff, gluing more and more little rocks on and eventually it started to look half decent. I realised I needed to treat the troll’s back like a scenic base. To this end I also started sprinkling some finer rocks and sand around the bigger chunks of warpstone. This really seemed to bring the model together. 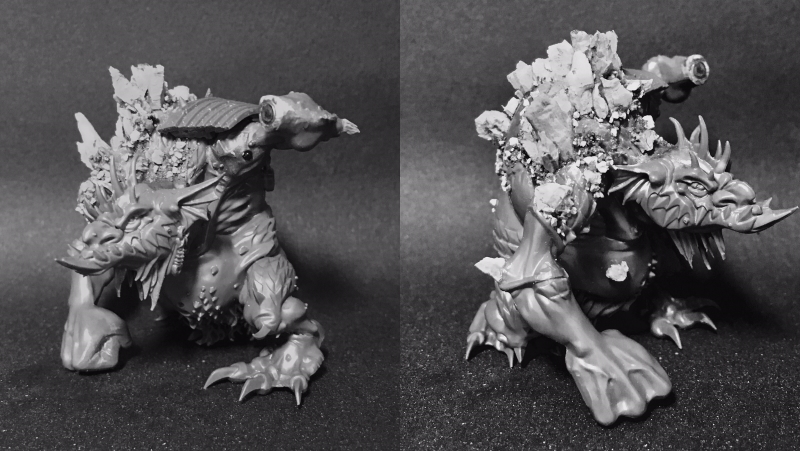 In these photos you can also see the addition of a shoulder pad, taken from a skaven stormfiend. 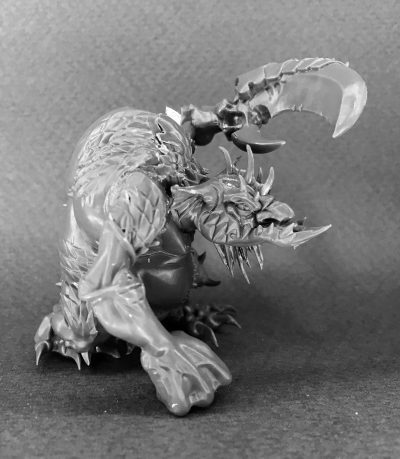 I thought this was a nice way to tie in some skaven aesthetic to the troll, and it also provides somewhere to put the team number and colours on the model. I added some scraps of cloth below the shoulder pad, again this lets me paint the team colours on, varies the model and also covers up the rough putty work below and the gaps below the shoulder pad edges. 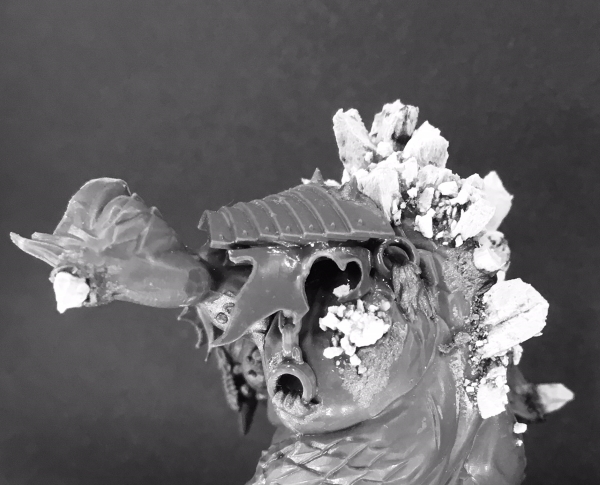 These scraps are from undead kits – their cloaks tend to be suitably ragged. I imagined the shoulder pad to be attached to the troll by means of some big metal rings inserted straight through it’s thick hide. Lacking any suitable rings in my bits box, I used the round injection point on a plastic sprue, drilled a hole through it, and then rounded the edges before slicing a ring off and sticking it to the troll. Chains are from the bits box, cut to size and glued in place. I then sculpted the stretched skin over the ring. 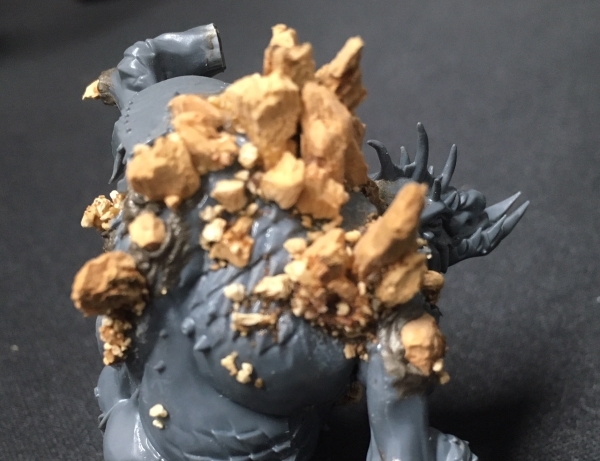 After gluing the rocks and gravel down I’m also going around sculpting skin around them – wrinkles for bigger rocks and in the case of the smaller bits, just generally smoothing them into the skin slightly. With this transition, the putty starts out very smooth where it blends into the rest of the trolls skin (using a clay shaper to “polish” the putty smooth) and gets rougher as it nears the rocks (using a cocktail stick to stipple in some texture). Hard to see in these photos but you can just make out the browner tone of the putty below. Still to do will be some gap filling here and there and blending many of the individual rock pieces together with some milliput (much better than green/brown stuff for sculpting rough natural surfaces) and finishing the folds of flesh around where the rocks jut from the skin and blending in the textures. I’m also in two minds about removing the scales on the river troll model completely, as they are possibly one texture too many with the grainy rocks as well.